The United Arab Emirates said one of its police officers, serving in a Gulf Cooperation Council force operating in the island kingdom, was among the three dead officers, according to the UAE state news agency WAM. Bahrain’s main opposition groups condemned the bombing as a criminal act and urged followers to ensure that protesters use only peaceful means to push their demands for reforms. Bahrain’s Shi’ite majority has long complained of discrimination, a charge denied by the Sunni-led government. The Interior Ministry said on its Twitter account that a group of protesters had broken away from a mourning procession in the village of Daih and started blocking roads. The explosion took place as police were trying to disperse the group, it added. “The initial investigation indicates that terrorists planted the bomb near a lamp post on Budaiya Road,” the ministry said in a statement posted on its website. “The device detonated while police were securing the roads and restoring order,” it said, adding that two other devices had exploded in the village without causing any injuries and a fourth had been defused. WAM identified one of the dead as Lieutenant Tareq Mohammed al-Shehhi. The Wahabi-led island kingdom, home to the U.S. Fifth Fleet, has suffered civil unrest since mass protests in 2011 led by Shi’ites demanding political reforms. In 2011, Saudi Arabia and UAE sent forces to support Bahrain’s rulers and quell pro-democracy demonstrators demanding reforms. However, huge demonstrations remain frequent and often lead to clashes with security forces. Negotiations between the government and opposition aimed at ending the turbulence have failed , as the Al Khalifa Government is trying to quell the Protest and the Demands by force , rather than making the Democratic System More strong , which may reduce their share in the Power . Opposition groups, including the main Shi’ite group al-Wefaq, condemned Monday’s blast and called on followers to ensure that protest activities were peaceful. “They assert their rejection of any practice that targets lives and property and call on the people of Bahrain, demanding their just rights, to abide by peaceful means and to condemn these criminal acts,” the opposition groups said in a statement sent to Reuters. The explosion occurred as hundreds marched in a procession to mark the final day of mourning for a 23-year-old Shi’ite who died in custody last week, of whom the Shiite Opposition have accused the Government of torture and denial of Medical treatment . The Interior Ministry said the man, who was detained in December and had been accused of smuggling weapons, had died of an illness. Social media were flooded with pictures of the policemen covered in blood as rescuers tried to apply first aid. 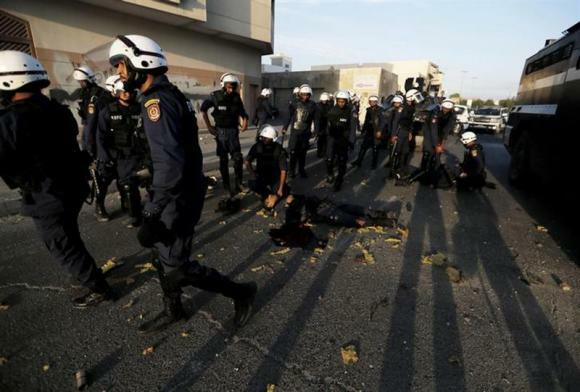 Last month, a policeman was killed by an explosion at a protest to mark the third anniversary of Bahrain’s uprising. The authorities are trying to do the cosmetic changes in the system, but the opposition says there can be no progress until the government is chosen by elected representatives, instead of the ruling family. A Wefaq spokesman said a group of masked men had attacked the group’s headquarters with clubs and knives on Monday, fleeing when police arrived. This entry was posted in Middle East and tagged Bahrain, Bomb Blast, Interior Ministry, Majority, Pollcemen, shiite Opposition, UAE, United Arab Emirates. Bookmark the permalink.